Rail Automatic Lubrication Systems – FLO Components; Rail Automatic Lube Systems for Gauge Face, Restraining Rail and Top-of-Rail – FLO Components – Automatic Lubrication Systems Specialist in Ontario and Manitoba. 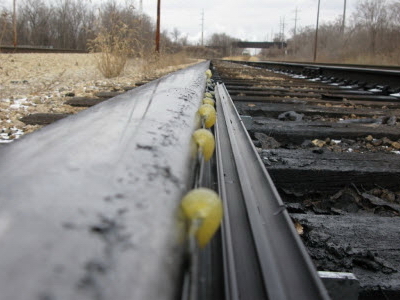 A drastic increase in wear is prevalent on rails, wheels and switches on highly strained areas of track networks. Typical wear patterns in curves include slip-deformation on the inner rail (low rail) and lateral wear on the outer rail (high-rail). Also, noise emission is greatest through curves. Stationary or Wayside, lubrication systems from FLO Components for rail flanks and rail heads lower noise emission and considerably reduce wear on rails, switches and wheels, reducing maintenance costs and increasing the lifespan of the rail network. FLO’s high-pressure systems enable the usage of NLGI 2 class grease, which offers exceptional adhesion to the rail and wheel as well as better lubrication properties. 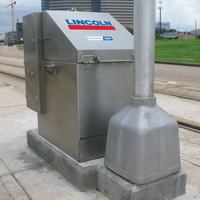 FLO’s Lincoln wayside lubrication systems apply lubricant with a wiper bar that is flanged to the rail profile. The lube is accurately applied to the contact surface such as the gauge face or top-of-rail. 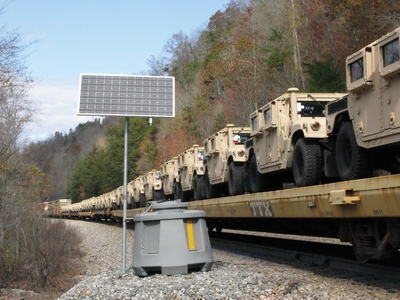 Sensors detect and count the axles of the approaching train and initiate a lube event. 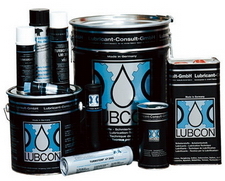 The duration of the event which determines the lube supply, is adjustable and can be set to the applicable conditions. 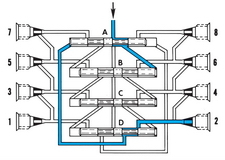 A high-pressure pump supplies the wiper bars with an exact metered amount of lubricant. 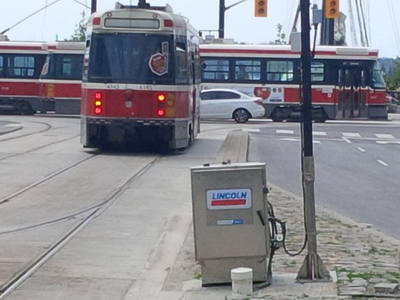 The lube is picked up by the train’s wheel circumference and evenly distributed on the rail contact area. Depending on the lubricant and application (gauge face or top-of-rail lubrication), the distributed lube is evident for kilometers beyond the lubrication station. High-pressure, low-volume pump ensures there is no clogging of lubrication ports. System effectively covers the rail with just enough lubrication = no waste. Exact metering of grease ensures each lube port receives the same small amountof grease every time without having to continuously “dial in” the system. Positive displacement design of divider block ensures a constant, metered volume of grease is delivered to each lube port regardless of back pressure or cold weather conditions. In curved sections, the high rail (outside) wheel runs on the gauge face. This contact results in semi-continuous friction that significantly causes wear to the wheel flange and gauge face. 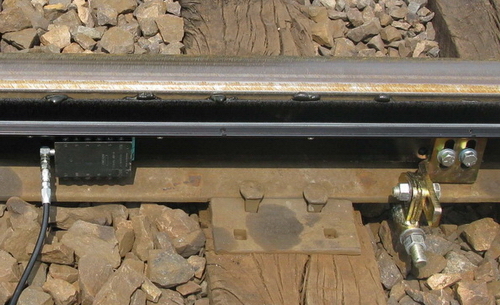 The strong contact friction between wheel and rail surfaces causes noise emission in the track curve. FLO’s gauge face lubrication system protects from friction and greatly reduces noise emission. • Places grease high on the gauge face so it can be carried by passing wheel flanges and avoiding grease migration to the top of the rail. • One gauge face system can supply several curves in succession. • Brush holds excess grease to be picked up by the next train which minimies grease waste. The path of the inner curve wheel is shorter and the wheel runs toward the rail middle causing tension. When the tension is greater than the frictional forces, the inside wheel jerks and slips. This slip-stick effect causes the inner wheel to shudder, resulting in screeching and wear on the running surface. This effect is especially prominent on very tight track curves. Applying a minimum amount of grease on the top-of-rail reduces both screeching and slip deformation. 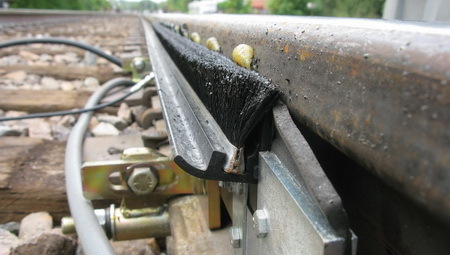 Restraining rails exist to support trains from derailing in curved-track situations. 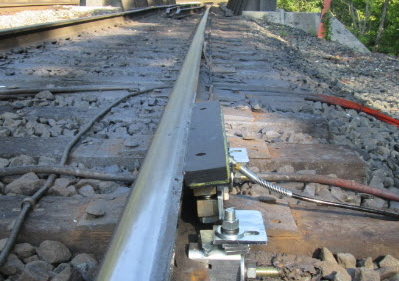 When the train begins the turn, the outside flange on the high rail side makes contact with the restraining rail. The friction from the contact creates high noise emission. FLO’s restraining rail lubrication system protects the rail from friction and greatly reduces noise emission. • FlowMaster pump – Highpressure, 24 VDC two-stage pump proven in harsh industrial applications. • Standard pump for gauge face, TOR and restraining rail. • P653S pump – Designed for compact rail lubrication systems intended for minimal consumption. 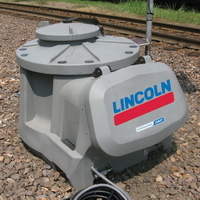 • Also used in rail head conditioning systems, especially in municipalities with public rail transport. • Lid opening provides easy access with bulk- or manual pail-fill methods. • Environmentally safe, double-wall polyethylene material design capable of containing an entire reservoir leak. • Smaller metal reservoir typically used in city applications. • Also available in carbon or stainless steel. 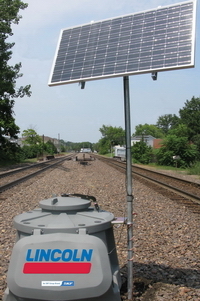 • Digital controller precisely controls the amount of material applied to the rail. • The exact volume of material dispensed can be measured and recorded. • The RS232 port can be used to transmit and receive system information to and from any hand-held device. • 170 W solar panel is designed to provide 20 plus years of life in extreme temperatures and low light conditions. 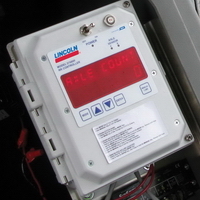 • The solar controller ensures a proper battery charge and disables the system if the batteries reach an unsafe level. 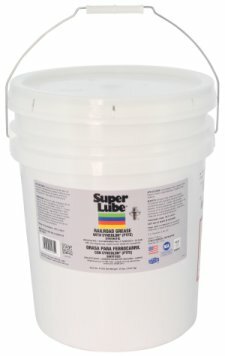 FLO also supplies Super Lube® and LUBCON specialty lubricants specifically designed for rail lubrication and noise suppression applications. For more information, see our Lubricants Solutions page. Contact us now to find out how small an investment is needed to lower noise emission, reduce maintenance costs and increase the lifespan of your rail network.